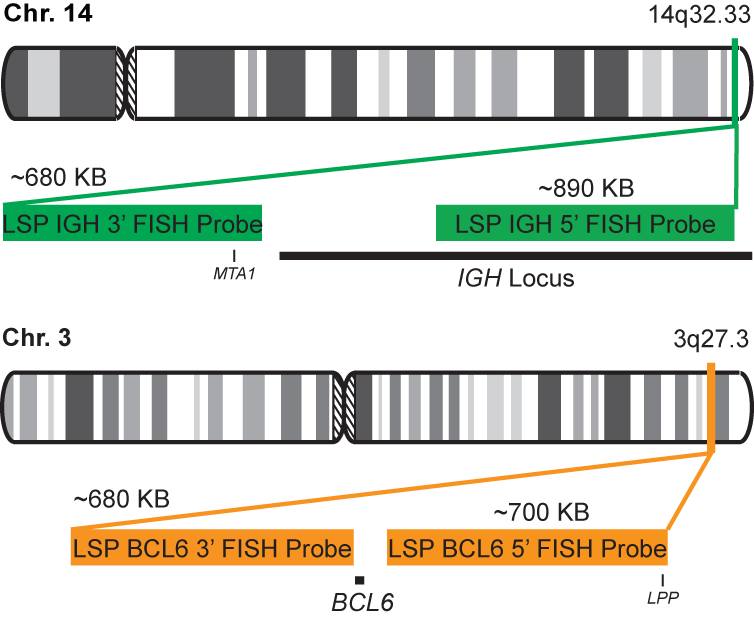 The IGH-BCL6 FISH probe set is designed to detect rearrangements involving regions of the human IGH locus, located on chromosome band 14q32.33, and of the human BCL6 gene on 3q27.3*. The kit contains two differentially labeled Locus Specific Probe (LSP) pairs. One set of probes covers some upstream genomic sequence of the 5’ portion of the BCL6 gene as well as sequences downstream of the 3’ part of the gene. The two probes are flanking sequences on both sides and inside the BCL6 gene where breakpoint clusters and individual breakpoints have been found. The second probe pair spans the immunoglobulin heavy chain gene locus (IGH@) and consists of a portion matching the 5’ (start) region encoding variable gene segments (IGHV), and a part that covers the 3’ (end) and downstream sequences. This probe pair is flanking an area of the IGH gene comprising constant gene segments (IGHC) as well as the delta segment (IGHD), joining region (IGHJ) and epsilon domain (IGHE). Almost all known breakpoints in IGH@ have been mapped to this region.